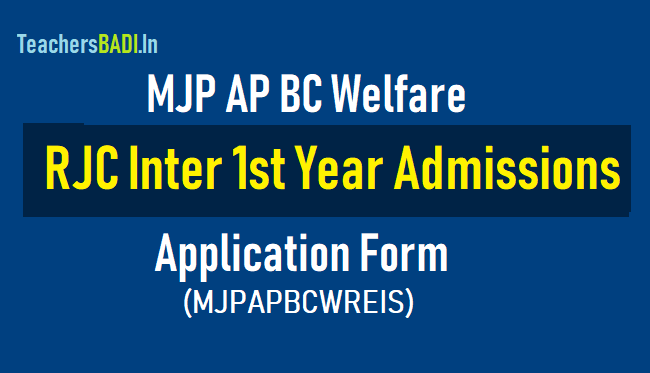 How to Apply for MJP AP BC Welfare RJC CET 2019 (MJP APBCWRJC CET), Apply online till April 14: Mahatma Jyothiba Phule Andhra Pradesh BC Welfare Residential Educational Institutions Society has given the MJP AP BC Welfare's RJC CET for Inter 1st year admissions 2019 notification and Applications are invited from the eligible students for admission into 1st year Intermediate of MJPBCWR Junior Colleges for the academic year 2019-2020. MJP AP BC Welfare's RJC CET for Inter 1st year admissions 2019 notification details are provided here. AP BC RJC CET for Inter 1st year admissions 2019 Application form is available at mjpapbcwr.in website for free download. Printout can be taken and filled in applications can be submitted to the Principal where admission is required. Principals shall select the candidates wide guidelines. AP BCWRJC CET 2019 Online application process begins, exams on May 5: The candidates who want to apply online can do so through the official website, aprjdc.apcfss.in, the online application process has been started from March 14, 2019. The application process for the MJP Andhra Pradesh (AP) BC Welfare Residential Junior College Common Entrance Test (APBCWRJC CET) has started. The candidates who want to apply online can do so through the official website, aprjdc.apcfss.in. The online application process has been started from March 14, 2019. The last date to apply online is April 14. the MJP AP BC Welfare RJC CET Entrance examinations will be conducted on May 9, 2019. For APBCWRJC CET, the candidates need to possess a Class 10 pass certificate. There are 15 per cent seats reserved for Scheduled Caste (SC) category candidates, 6 per cent for Scheduled tribe, for other reserved category candidates, seats are also reserved as per the official notification. B) The students should apply within the Jurisdiction of the College. C) The Admissions will be done on the merit of the student in the SSC Examination, In case the merit is equal the Subject wise GPA Starting from Mathematics, Science, Social, English, Telugu and Hindi will be taken into count. E) In case there are unfilled seats in any category may be filled with BC students. F) 75% of seats are reserved for students of BC Residential schools and BC Welfare Hostels and 25% of the seats may be allotted to the other students who have studied in Social welfare and Tribal Welfare Residential Schools, Hostels, Z.P. Schools or Private Schools. The age of the student shall not exceed 17 years as on 31.08.2019. The general category candidates need to pay an application fee of Rs 250. For candidates belonging to the reserved category, the candidates need to pay as per the official notification. ii. The candidate after satisfying himself/herself about the eligibility criteria for the submission of application through online shall pay a fee of Rs.250.00 through online from 14.03.2019 to 14.04.2019 for submission of application through Online. iv. On payment of fee at ONLINE, the candidate shall be issued a Journal Number with which she/he can proceed with submission of application through online through the website http://aprjdc.apcfss.in Issue of Journal Number does not mean that the candidate has completed submission of application online. It is only a confirmation of the fee received. vi. The candidates shall follow the procedure for submission of online application as given in the ‘Information Bulletin’ and also as per the instructions provided online while filling up the online application form. The Candidate should be ready with photograph of size 3.5 X 4.5 cms before filling in on-line application. The Photo should be scanned and uploaded along with the application form. vii. While filling the online application, the candidate has to opt the course. Once a course is opted, that cannot be changed. xii. The selection of the candidate will be summarily rejected if they fail to submit the necessary documents at the time of admission. How to apply for APRJC CET 2019?